It is is fossilized tree resin. It is used as an ingredient in perfumes, as a healing agent in folk medicine, and as jewelry. It is sourced specifically from the Pinus succinifera tree. The fossilization of this can be traced back to the Tertiary period, meaning that stones formed approximately 50 million years ago. The formation process of the stone begins with transformation of resin to copal. The transformation is triggered by high temperatures and pressure of overlying resinous sediments. The exposure to heat and pressure repels terpenes, which can cause deterioration and decay. Through time and resistance, the resin eventually hardens and becomes fossilized into stone. Many trees produce resin, but most will not actually produce it. The tree resin must be very resilient and resistant to decay. The majority of resin deposits cannot handle prolonged exposure to sunlight, rain and extreme temperatures. It originates as a soft, sticky tree resin, it sometimes contains animal and plant material as inclusions. Stones with inclusions of plants and animals are costly and are rare. Collectors do collect these gemstones. It occurs in a range of different colors, but it is mostly yellow, orange or brown. Golden-yellow is usually hard, translucent resin from evergreen pine trees. It can also occur whitish to pale lemon-yellow and brown to nearly black. The Dominican Republic is known to produce rare blue coloured resin. There is also rare green and red colored. Red coloured is sometimes referred to as "cherry amber". Wear its Jewelery , carry a peice in your pocket, or rub soft resin on your spin to keep you safe from harm. 1. These yellow stones help to relieve stress and may also help to clear depression. 3. They help you to enhance your creativity. 4. It links the everyday self to the spiritual self, and is highly protective against any type of negativity, especially from psychic sources. 5. It is used to ease pain in joints and ligaments. 6. It empowers the endocrine system, creating good healing outcomes in the stomach area. 7. 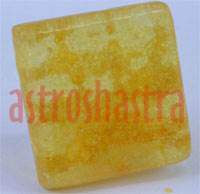 It is known to be one of the better natural crystals to use for protection from psychic attack.